How Barnoski Painting delivers lasting beauty to your home. 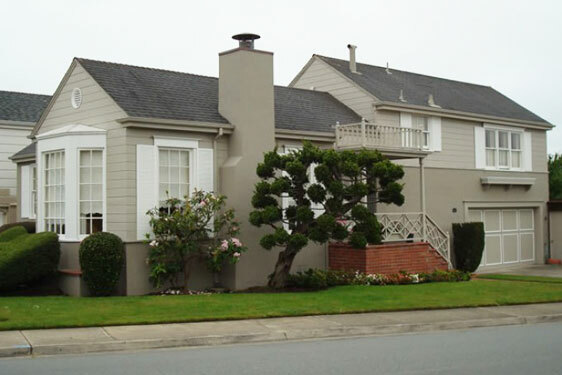 As we mentioned on our services page, we have been painting in San Francisco, Daly City and the peninsula for over 40 years and have created the best procedures to work around the weather and moist conditions. Our method and products are designed for this region to provide a premium job and the best value. When its time to choose a colors for your exterior or interior, we provide color books and once you’ve narrowed it down we get you live samples of the paint. We exclusively use and strongly recommend Benjamin-Moore, Kelly-Moore, Dunn-Edwards and Sherwin-Williams. We always purchase the premium grade paints from these companies. It may cost a little more, but these brands outlast all other lower quality products that many other companies use. We always use premium products for all our equipment and sundries. Powerwash the structure to remove dirt, grime and mildew. Cover all grounds, fixtures, windows and any other items as needed. We’ll work around trees, plants and bushes. Prepare all wood to remove any loose or flaky material using a master razor scraper, power sanders and hand sanding to smooth. Dig out any rusty nail heads and apply Rust-Oleum™ rust converter primer to all rusty metal. On stucco, scrape all open cracks and loose material. Prime all wood and spot prime open areas on stucco. Fill all open cracks and holes with caulking, spackle and elastmeric patch to waterproof. Apply 2 full coats to all stucco. Apply 2 full coats to all wood, equals 3 coats. Inspect the job and touch-up. Vacuum and sweep all grounds after each day to leave neat and clean. Call or email now to schedule a free price quote. Cover all floors and belongings with plastic and tape and remove switch plates. Wash all trim, bathrooms and kitchen areas to be repainted with T.S.P. cleaner/degreaser. Sand all trim, bathroom and kitchen walls and ceilings and all other walls and ceilings. Fill all open cracks and holes with premium grade caulking, spackle and sheetrock mud where needed. Prime all trim, bathroom and kitchen walls and ceilings and all other walls and ceilings. Lightly sand all primed areas to ensure proper addhesion of top-coat paints. Then apply 1 full even coat of premium grade paint to all walls and ceilings, usually flat or low-sheen or eggshell. Then apply 1 full coat to all trim, bathroom and kitchen walls and ceilings, usually gloss or semi-gloss. One primer and 1 top-coat equals 2 full coats, however some deeper base tints and darker colors may need more then 1 top-coat. In that case 2 to 3 coats may be needed to acheive desired result and finish. Clean-up and vacuum floors, clean windows and leave everything neat and clean. Once we schedule an interior job, we complete it on time, on budget and on schedule. 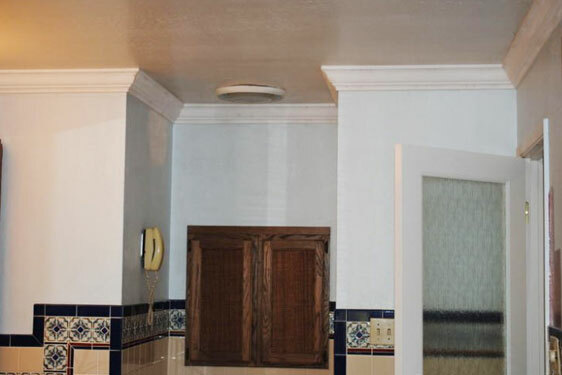 Every job is detailed for each individual home, but our overall process is a result of proven technique and experience since 1976 which is superior to any other method. You can pay more, you can pay less — but you won’t get a better job at any price.